Due to the lack of such facilities, Air Force has to keep its frontline aircraft in rear locations during operations near Pakistan border. New Delhi: Seeking to provide protection to fighter aircraft from enemy bombing or missile strikes on air bases, the government has cleared the construction of around 110 hardened shelters for the Indian Air Force (IAF) at locations close to the borders with both China and Pakistan. “The central government has cleared a project for the construction of around 110 hardened shelters also known as blast pens which protect the fighter planes from enemy missile or bomb attacks,” government sources told ANI. “The cost of the project would be more than Rs 5,000 crore and the blast pens would be built in a phased manner at the air bases. 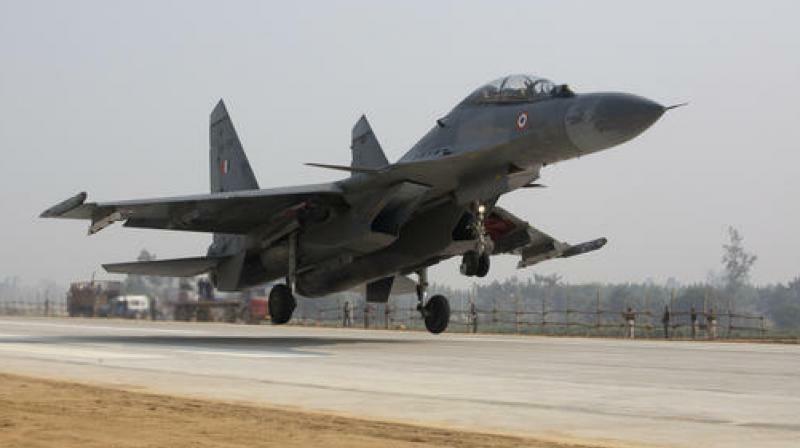 This would allow the force to keep its frontline planes such as the heavyweight Su-30MKI at forward bases without the worry of getting damaged on ground,” the sources said. Due to the lack of such facilities, the Air Force has to keep its frontline aircraft in rear locations during operations near the Pakistan border. Pakistan had launched an attack on Indian positions on February 27 after the IAF hit a terror camp in Pakistan on February 26. The IAF had lost several of its planes during the 1965 war with Pakistan as these were kept in the open and the force has, since then, been creating these blast pens for protecting its aircraft. These hardened shelters are made up of very thick concrete walls which can withstand heavy attacks from the enemy.